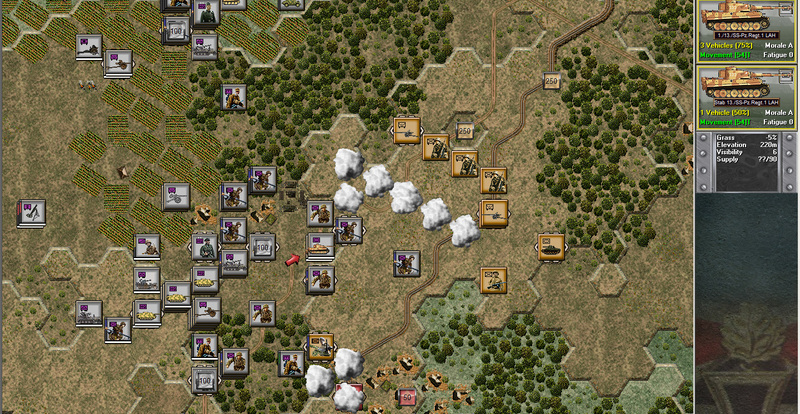 The release of the first Panzer Battles title is just hours away. 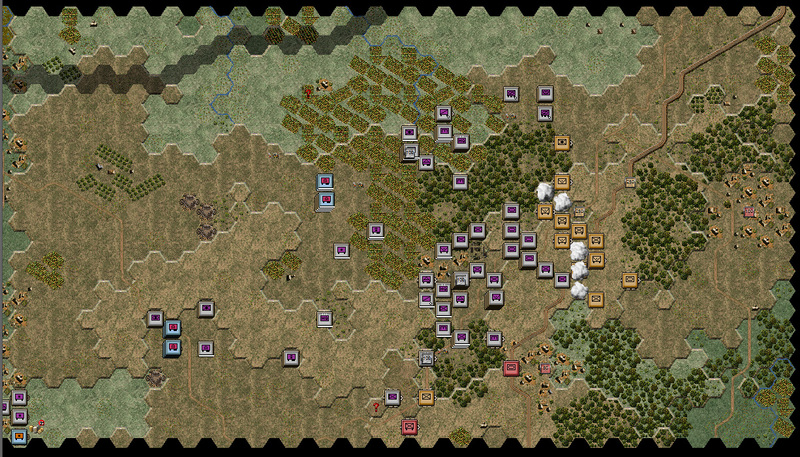 I am pleased to present an AAR to show the game play and "feel of battle" of Panzer Battles Kursk, The Southern Flank. You are cordially invited to share my command post during this mission. A zoomed out view of this scenario's map. My forces are the only icons visible. The screenshots are better seen when expanded. Please remember to right click and open them in a new window/tab. Teterevino North, South West of Prokhorovka: July 10th, 1943. 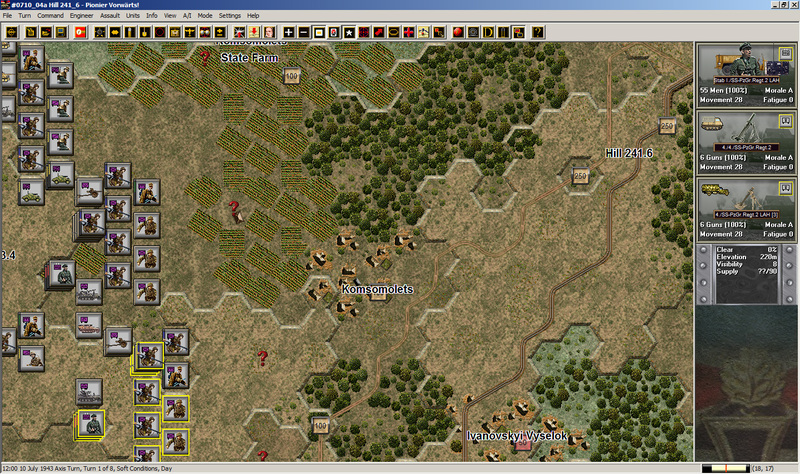 (Scenario Size: Regiment. German Human vs Soviet AI) SS-Obersturmbannführer Hugo Kraas's 2nd SS Panzer Grenadier Regiment had rested for the last 48 hours. Reordered after the initial days of battle, it's I &II Battalions reinforced by the Aufklarüngs (reconnaissance) Battalion were to clear the two large collective farms between Teterevino North and Prokhorovka. This is a shorter version of scenario #0710_03 focused on the clearing and capture of the Komsomolets State Farm and Hill 241.6. The bulk of my forces is the 2 SS PzGr. Regiment. 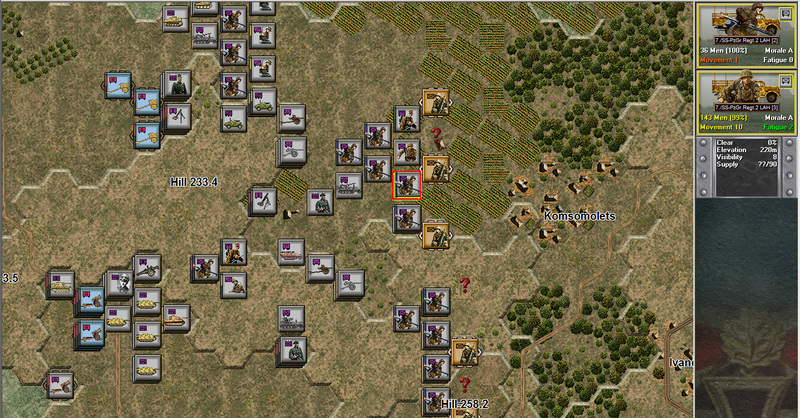 I also have a reconnaissance battalion to the north of my sector, and some armor echeloned to the rear of my two PzGr. battalions. 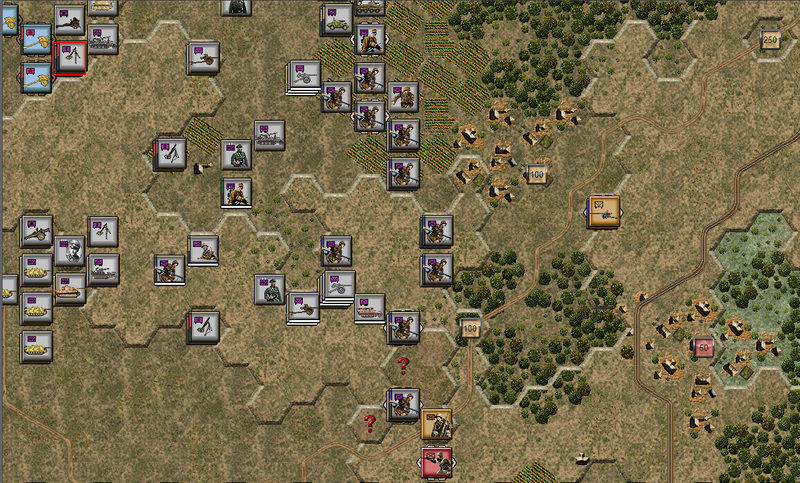 The armor units are fixed until turn five (scenario length is eight turns). The armor I have available is just a company sized force, mainly StuGIIIs and 4 Pz VIe Tigers. The tactical plan is a sector wide attack with points of main effort on the low area south of Komsomolets and Hill 241.6. We will clear Komsomolets and the low area south of it with the two PzGr. battalions and then use these terrain gains to assemble a combined arms push (infantry plus armor) onto Hill 241.6. The reconnaissance battalion on the north will be used in an economy of force role, clearing the state farm area and pushing on a west axis. Ideally, the reconnaissance battalion would provide a great opportunity for a reconnaissance pull. But the time allocated for this mission (8 turns/4 hours) does not allow for a change in the point of main effort. A zoomed in view of a portion of the map. The two PzGr battalions are highlighted in yellow. To the north (not highlighted) is the reconnaissance battalion. The interface should be very familiar to anyone who played a Tiller game. The buttons and the top menu are almost identical, plus minus change. This section of the map shows the objectives (icons with numbers) and how many points are worth. Note how the objectives in Hill 241.6 are worth 500 points. The game is turn based, with a IGOUGO game play (one player moves all his units, then the other player does the same). Right now moving into contact. The unit highlighted red is a weapons platoon, and its parent company is highlighted yellow. The red question mark icons are suspected enemy positions. Right when the weapons platoon moves up, the enemy opens from the top of the hill. Don't worry, I will not post a screenshot of every move. Just wanted to show you that spotting the enemy is not automatic and that the German unit also adjacent to the Soviets was not able to spot the enemy until shots were fired. 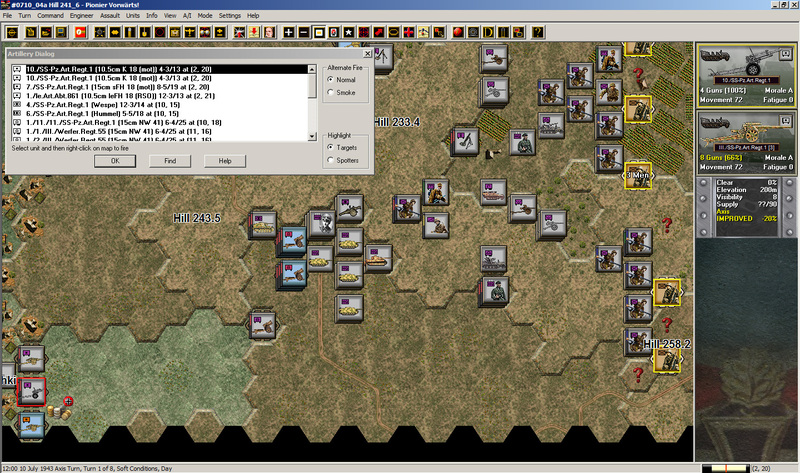 In the screenshot above, please note the two units on the information panel. It is showing a PzGr company and a weapons platoon. These two units work marvels when they are close together and offer a great flexibility for fire and maneuvering. The bulk of the first battalion has moved near Hill 258.2. Fire support from mortars is called. The second battalion has just made contact west of Komsomolets and is starting to suppress the enemy positions with their weapons platoons. One of the things that will take some time to adjust your fighting instincts to is that heavy weapons can shoot from afar. 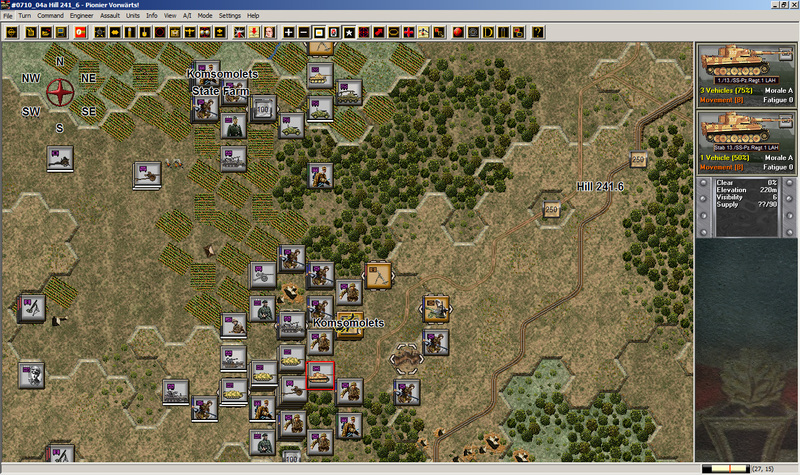 In this screenshot, the maximum fire range of a PzGr company is highlighted. Keyword is "maximum": don't get too excited, they can shoot that far but like in real life hitting something is another matter altogether. The maximum range of a weapons platoon. No LOS restrictions are computed here nor above. A good indirect fire plan is crucial for the intense fighting at Kursk. 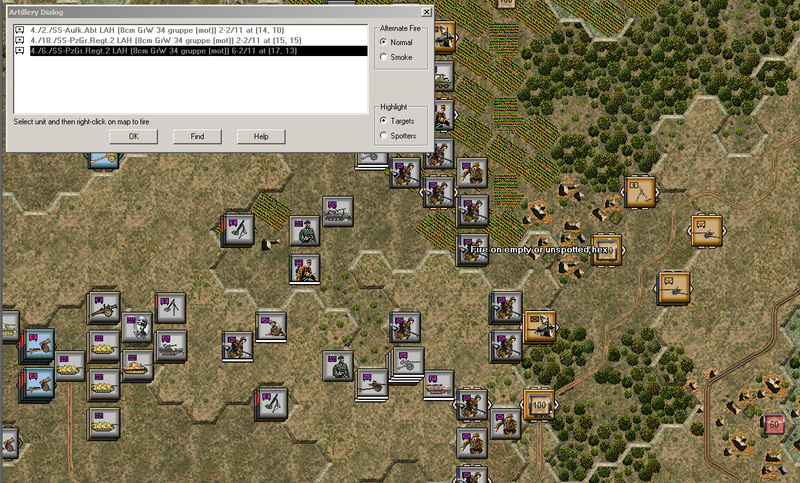 The artillery dialog offers a great way to navigate through guns and targets. In this case, it is at the end of turn 1 when I decided to use my artillery. Remember, my units spent the turn getting into contact. Units can attack by fire and assault. A combination of direct and indirect fire upon the enemy will disrupt the enemy, making the final assault less costly in blood and time. In this screenshot, grenadiers from the 1st Battalion storm enemy trenches at Hill 258.2. 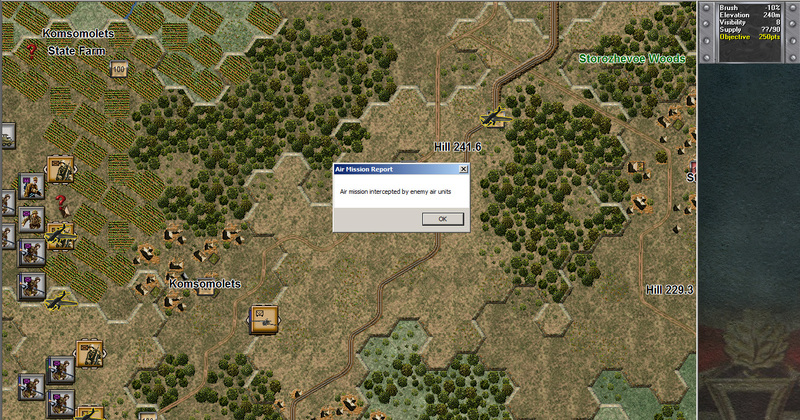 The assaults are resolved by hitting a button like the one found in the Panzer Campaigns games. The assault succeeds. Then enemy losses 7 men and runs down the hill. 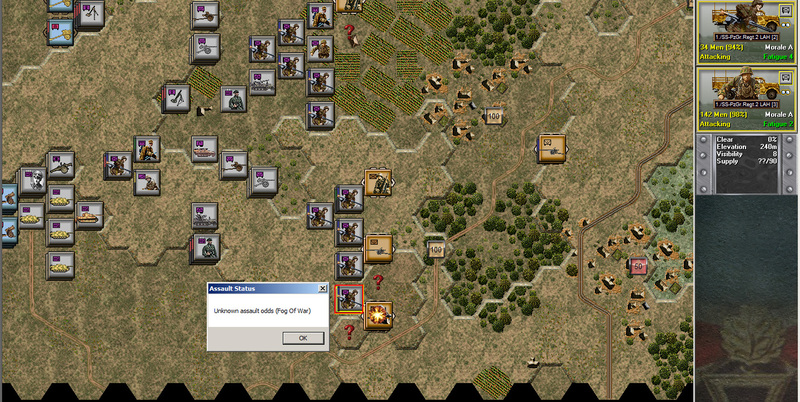 My units (details on the right panel) have no movement points available to pursue them, but they fire at them and inflict more casualties. Do not underestimate the firepower of the weapons platoon. In this case, the platoon highlighted red has inflicted some losses on the Russian infantry sheltering on a trench. 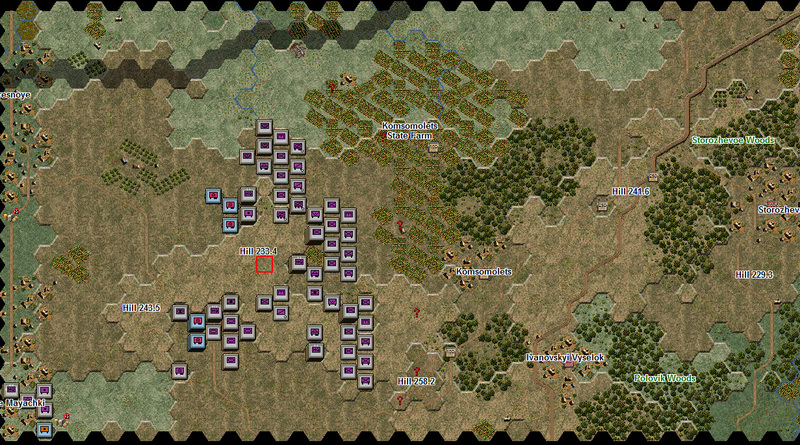 By the end of turn 2, the enemy outposts have been cleared by direct assault and the battlefield looks empty again. Concealed in these not-so-forgotten farmlands, the Soviets await. As we continue to push forward and bump onto more enemy prepared positions, the depth of the Russian defensive tactical deployment becomes evident. Unable to reach the enemy positions by assault, and knowing that they will hit us hard sooner than later, we harass them with indirect fire. The artillery dialog windows shows what is available right now. I am not a big fan of wasting rounds on suspected enemy positions, but it may come in handy sometimes: the ability to call indirect fire missions on either greatly concealed enemy or just on the tactical void of empty real estate. On the north flank, the reconnaissance battalion is making steady progress. The opposition is no less tough than in the south flank and the terrain (crop fields) offers a lot of concealment for the enemy. One sad event is pictured here: the loss of 12 troopers to a minefield. This is the situation at turn 4. The 1st Battalion (southern flank) has secured the low terrain south of the village of Komsomolets. The 2nd Battalion is still clearing the village amid stiff Soviet opposition. 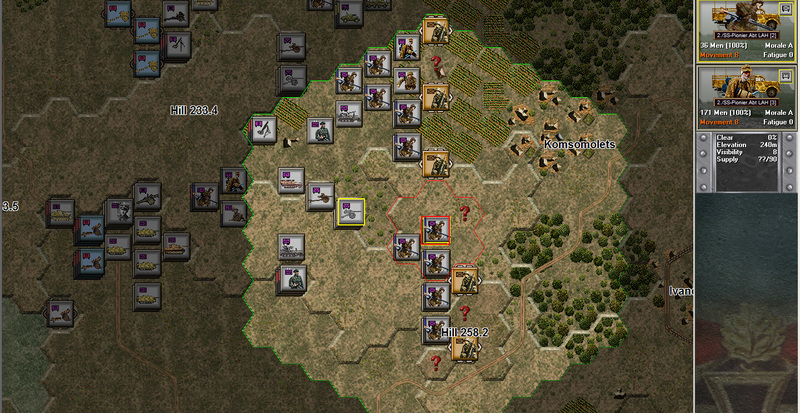 The armor units have been released and are moving forward towards the front. Many support units have been moved up because of the success of the 1st PzGr. Battalion. 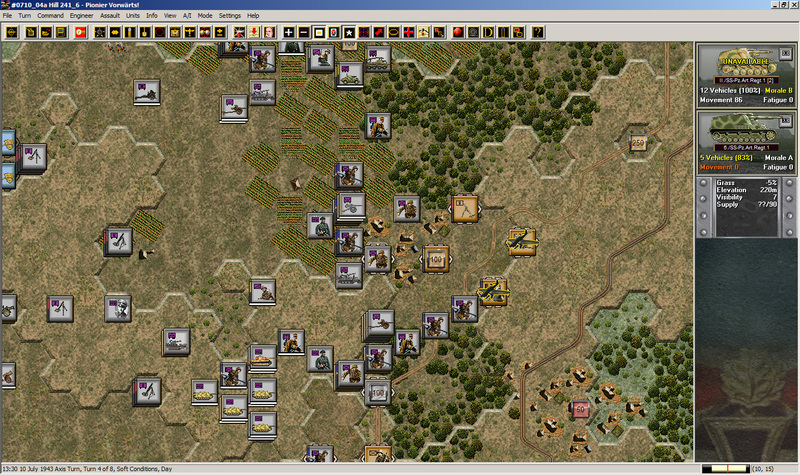 During turn 5, most of Komsomolets is cleared by a succession of assaults by the 2nd PzGr Battalion. Our casualties are light, but the slow pace of the grenadiers is becoming an issue. The Tigers and Stugs have arrived now to the low area west of Hill 241.6. The success of the 1st PzGr Battalion (south of the Tiger tanks) is wonderful news. Some overeager grenadiers have just climbed on the slopes of Hill 241.6 and continue to push northwest. Note also the reconnaissance battalion, steadily pushing northwest across the State Farm. It is now turn 6 and the arrival of good news have come to an end. Right when a firm foothold on Hill 241.6 has been established, a wall of enemy units is clearly visible blocking the road and railroad. 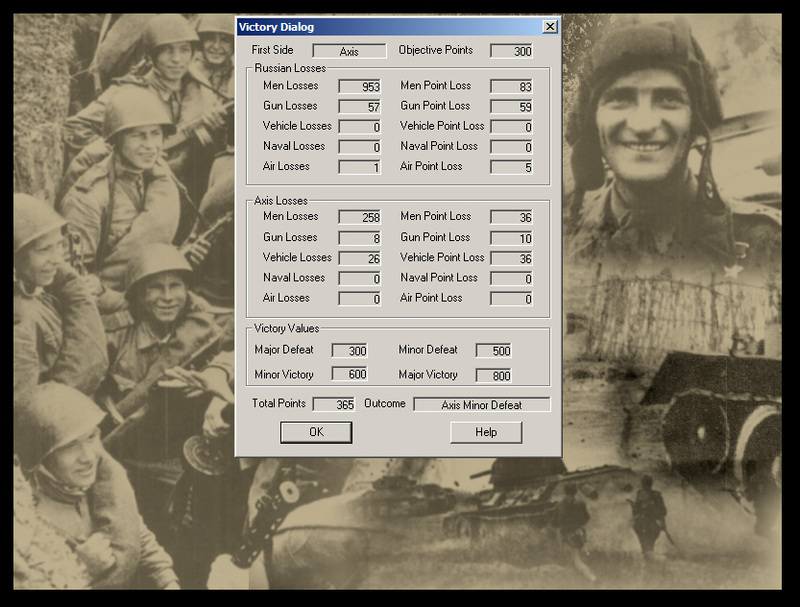 Note the enemy disposition in relation to the objectives (icons with the 250 victory points). 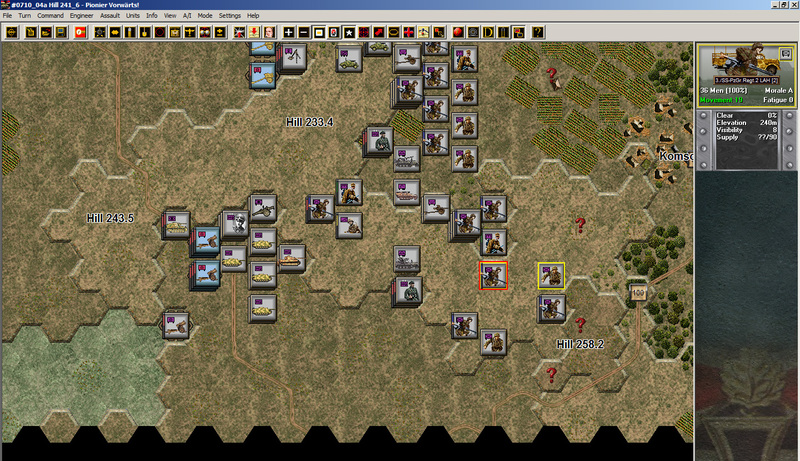 The only grenadiers more or less available to move forward are the ones of the 1st PzGr Battalion (south flank). But they are also being challenged by more than one torn on their right flank: enemy armor spotted, sir! The 2nd PzGr. 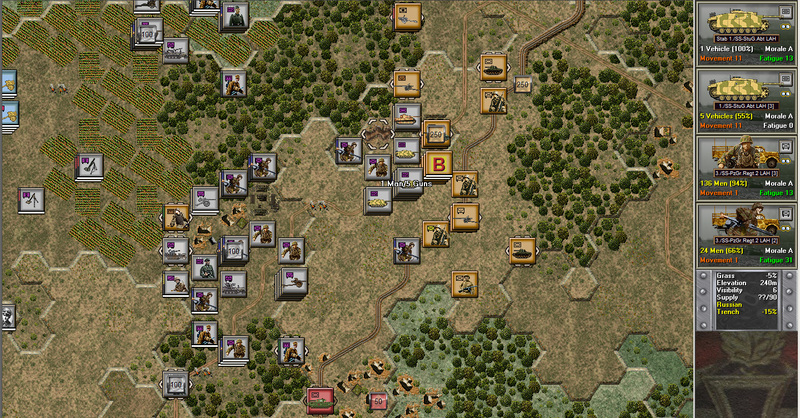 Battalion is still entangled in Komsomolets, due to a mix of bypassed enemy units, rubble and just plain built-up area movement complications. Yeah, the reconnaissance battalion up north is moving nicely. But who is going to exploit their success? The infantry to armor ratio is not on our side. Neither is time (this is turn 7). The only thing right at this moment is the availability of indirect fire support, which we use to conceal the delicate moment of moving up the slope of Hill 241.6 with our armor. Our artillery is now firing smoke rounds. The ability of the Russians to keep their anti tank guns concealed is uncanny. Our clever obscuration plans are derailed when a new enemy AT gun pit is spotted. The tanks and assault guns loose precious time engaging them. 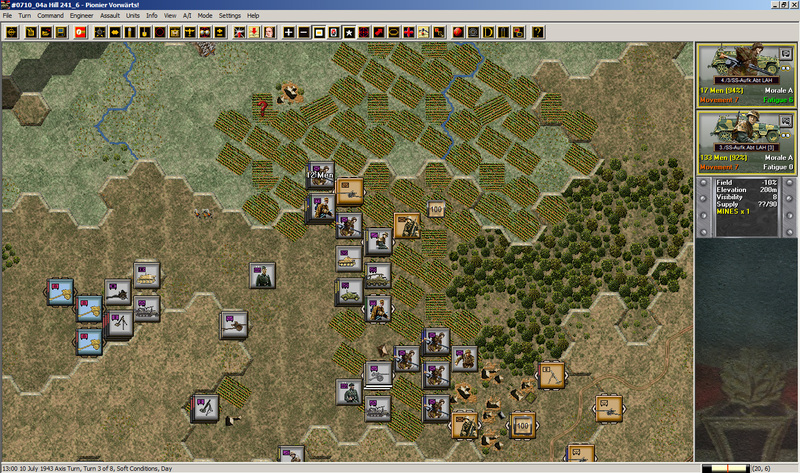 A zoomed out view of the battlefield to show how the units have moved forward. The reconnaissance battalion, up north, has advanced the furthest. I can only think what I could have done with an extra battalion of tanks! The 1st and 2nd PzGr Battalions, plus the armor, have just started their way through Hill 241.6. At Hill 241.6, all appearances of careful tactical combat have been replaced by a savage succession of armor assaults against guns. 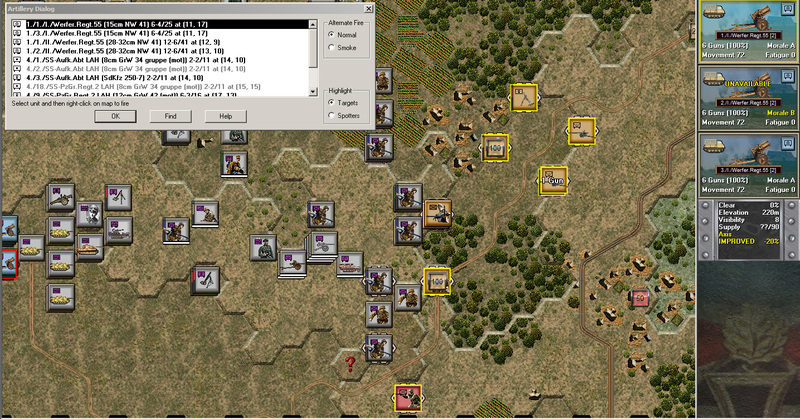 With not enough grenadiers to clear the entire enemy position, the armor units end the scenario with the first objective in sight but unable to reach it. And then the scenario ends with a minor defeat for my forces. 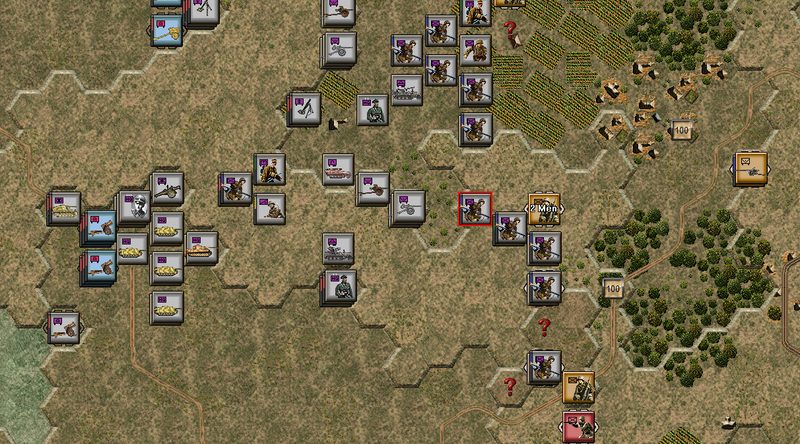 This is a great scenario that shows the distinctive features of tactical combat at Kursk. The depth of the Soviet defensive position literally swallows German shells, men and vehicles. 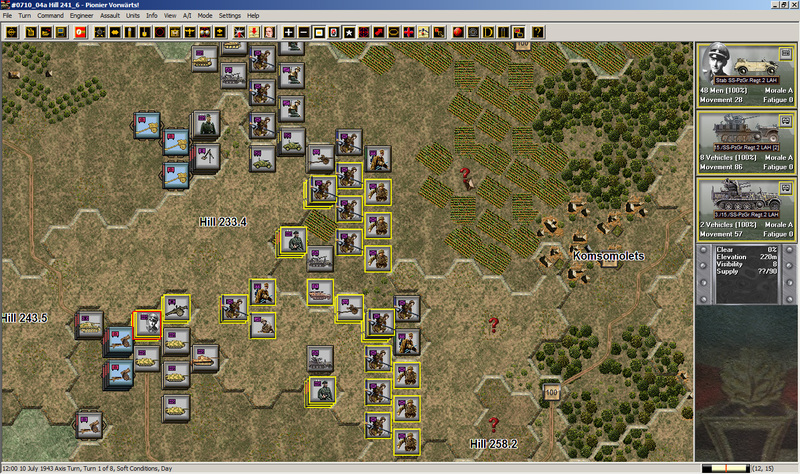 The vast indirect fire resources at my command were not enough to crack the enemy's defenses open as I have thought. I was unable to keep the momentum of my main effort, giving the Soviets a chance to shoot back at their pleasure. I underestimated how much involved and difficult is fire and movement through woods and villages. The 2nd PzGr Battalion inability to clear himself from enemy remnants in Komsomolets was a pivotal factor in my defeat. 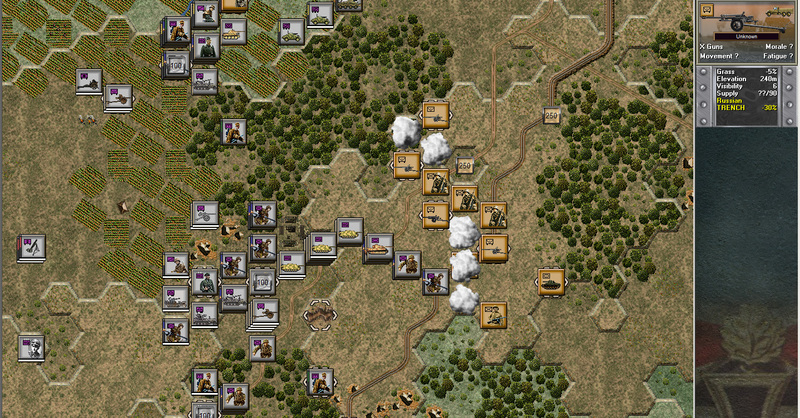 Panzer Battles is cleverly designed and provides a much desired scale of combat that was missing from the Tiller line of products. The game play is very fluid (lots of things happen per turn) and I find myself not overtaxed even with the biggest scenarios I tried (one at the Corps level). This scenario took me a couple of hours to play, but I was taking notes and screenshots for the AAR. I hope you enjoy reading this AAR as much as I did playing the scenario and writing about it. Here is to a great weekend of tactical war gaming! Been speaking to David Freer and you do realise the main unit is a Platoon. I think you should only combine into Coy's rarely due to to many bodies in a hex. I know some scenarios have a fair few combined units at the start but I think your supposed to break them down. This is one area that confuses me with PB. As I don't really know when combining a unit to coy scale is wise. I'd rather you coudln't do it..and the only other thing I'd have loved is if the game had been WEGO. Its David here. Its better to typify that there is no 'main' or perfect unit in game. Each formation size has advantages & disadvantages. Companies are key for doing what Jay Cee was doing in the AAR. You need firepower to overwhelm the defenders quickly. That said you can have a disaster like the minefield incident where the density modifier amplified the losses. It's all about trade-offs. The one thing I didn't see Jay Cee do was use his recon assets well. There is an important order called 'Recon Spotting'. There are hills overlooking the farmland and a quick recon spot would have helped identify enemy positions and ensure the artillery was hitting 'known' targets. Recon spotting gives you a chance to see units that are concealed but in line of sight. This is some of the subtlety in the game. I promise you, you will never have enough engineers or recon assets. Can you elaborate on the scale? How is it different from Panzer Campaigns or Campaign Series? Never mind. I read your previous post. At Company level, it is between Panzer Campaigns and Campaign Series. Scale is larger than campaign series. Campaign series is more board-game like since it deals with steps instead of specific number of men. 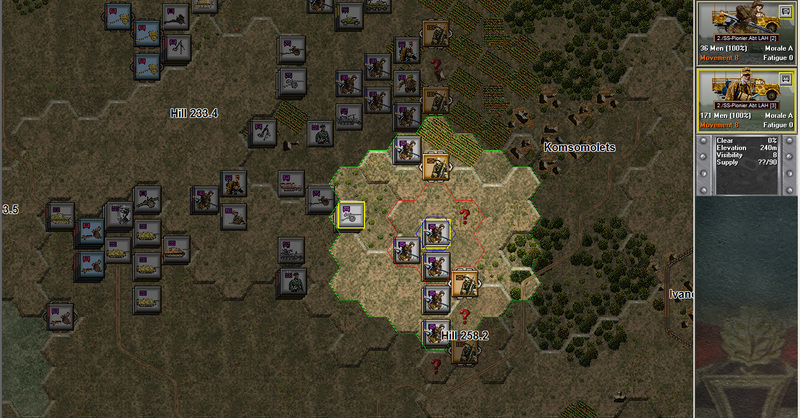 Do the non-arty units actually shoot across hexes like Campaign Series or only adjacent like Panzer Campaigns. I never said the company was the main unit. I may have said it was the "typical" size of unit. Off course I realize that I can combine/breakdown a company into platoons. I didn't cover the combine/breakdown ability in this AAR because after all, mission-enemy-time-troops considerations didn't demand a swarm of platoons roaming in the farm lands. I would love to be proved wrong in this assessment, but so far I see no reason to breakdown my grenadier companies just for the sake of it (i.e. if the mission doesn't demand it). 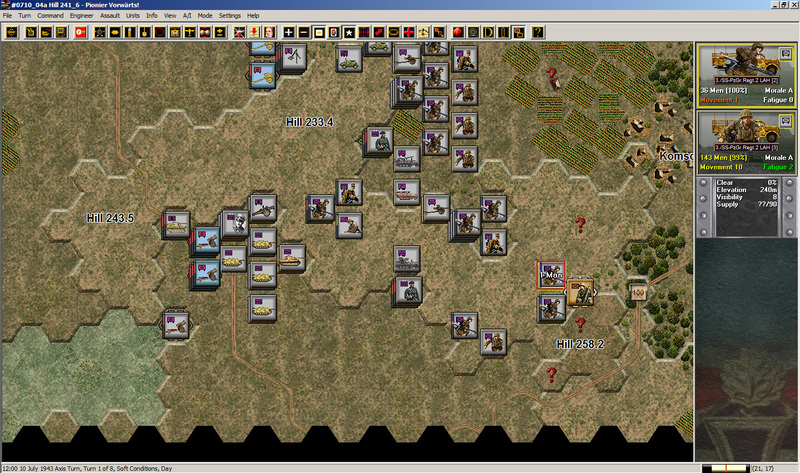 The only exception was the southern flank of the 1st PzGr Battalion during turn 5. But they did hold fine, those guys. At the scenario start. The only recon unit (and able to perform recon spotting) available for schwerpunkt units (1st and 2nd PzGr Battalions) is a motorcycle company located 1.25 km back from the FLOT. Their mobility is very limited (500 meters per turn) and I thought it was not even worth the shot trying to "recon spot" with them from such afar. To my amazement, I found while playing other scenario that these guys can recon spot fine from such a distance. I wonder if, with a bit of luck, almost every Russian position could have been spotted at the crest of Hill 258.2. Spotting has lots of factors including distance from the spotter number of men/vehicles used etc. Hi JC. Great AAR. Is there an editor? And is there a map builder? Purchased and downloading. Between this and the Grenada demo, I suspect I'm set for the weekend! I am very, very impressed with this. The map and counter art is a great improvement. Game scale is very enjoyable. The wealth of background material and documentation is a real treat! Chris, yes there is an editor for the components, ie playing pieces, an editor for the order of battle and an editor for the scenarios. As far as the map, there is an editor that allows you to create a smaller map from the maps included in game. There is no bespoke map editor included though. Doug, thanks for the kind comments. Both Mike Avanzini and I went a bit crazy with what was included in the package. The challenge now is maintaining this standard going forward! The graphics improvement was well over due and like a new girlfriend it's the 'look' that counts! I recently read George Nipe's excellent book about the Southern flank of Kursk, "Blood, Steel, and Myth". I can't recommend it highly enough. Extremely well written, and does an amazing job of busting the many long lived myths of the battle, and specifically about Prokhorovka, "the biggest tank battle ever". Nipe's book as well as Valeriy Zamulin's were key inspirations for many of the scenarios. If you have Nipe's book it's fun to see if you can associate the passage with the scenario. Any comments about historical accuracy? Do the scenarios tend to deliver reasonably historical results if one uses the same approach as the actual combatants? It worries me that nearly the exact same combat algorithms are being used in these games which cover everything from Napoleonics to Modern. 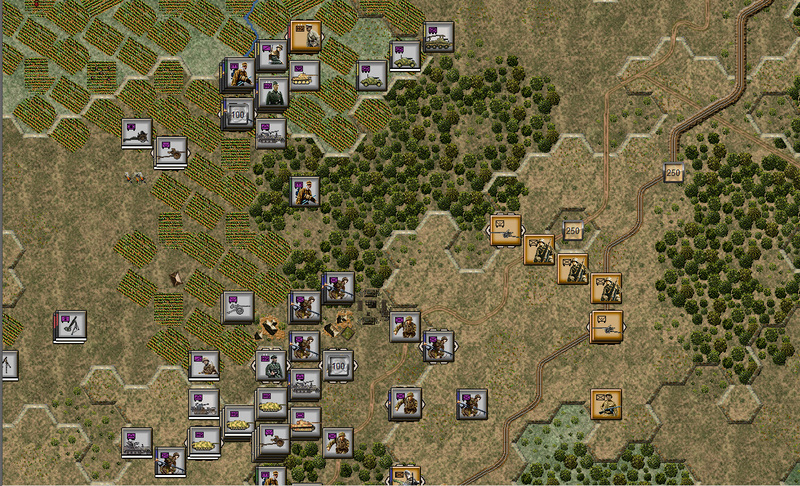 I played this, then went back to Napoleon Jena-Auerstadt, and I have to tell you that it felt extremely similar in terms of combat results and even tactics. Quantifying combat power via weapons capability plus morale is not enough. You need some kind of assessment of proficiency. You can have high morale with low proficiency (think of 1941 Russian troops who refused to give up long past the point of reason), but in this system they are muddled together. If Tiller wants to keep pumping out these re-skinned versions of Battlefield: Waterloo, I guess that's fine. But this is my last purchase until he makes an effort to sit down and re-examine the theoretical basis of his games. LnL Heroes of Stalingrad does a much better job of simulating squad-level tactics than Squad Battles ever did. Similarly, SSG's Decisive Battles were far more interesting than any of the Panzer Campaigns, and delivered much more historical results while teaching the right operational lessons. Lastly, the sophistication of something like Command Ops far outstrips Panzer Battles in terms of modeling Order delays, Command and Control, and the fog of war. If someone can demonstrate that this game actually rewards historically-effective tactics and delivers realistic results, then I'll happily accept that. But none of the reviews or first impressions seem to bother with that. They seem entirely focused on the small iterative improvements in the artwork, rather than examining the shaky theoretical framework and combat algorithms that underlay all of these games - all of which deliver nothing more than "Panzerblitz" (mid-70's) levels of sophistication, and completely ignore critical areas that subsequent games have done a great job of elucidating. This seems to have all the features of the Campaign Series, but with worse graphics.